Ramayana story: Little squirrel who helped Lord Rama! Here in a story from the Ramayana. Lord Rama and his army of monkeys were preparing for war with Ravana. Rama asked his army to build the bridge over the sea. Work began at once on a stone bridge. The monkeys pulled out rocks and heavy stones from the mountains, and carried them to the sea. difficult work and it took a long time. Thousands of monkeys worked night and day. 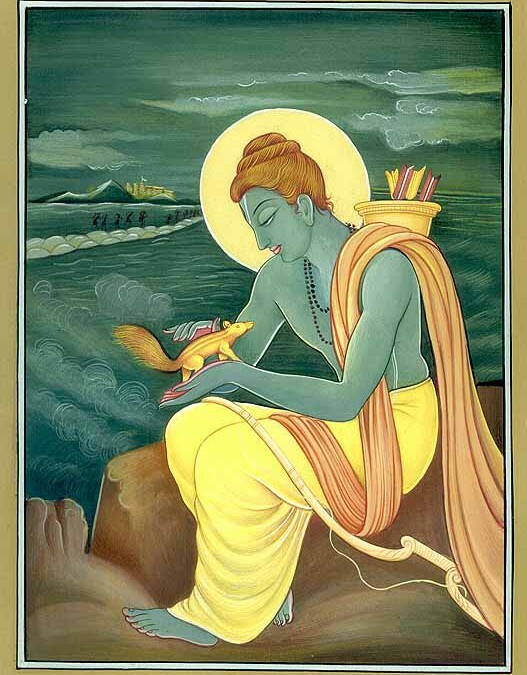 The squirrel, crying out the name of Rama, fell into his hands. Then Rama held the squirrel close to him. No task and service to Sri Rama, however small, is unimportant! Every task should be looked upon as service to the Lord, and his blessings will always be with us. We should never forget that love and dedication is what matters to Lord Rama and not big services and show we make for our prestige.